Menorrhagia affects approximately one quarter of women aged 18–57 years(1). The preferred terms to describe menorrhagia are heavy menstrual bleeding (HMB) and abnormal uterine bleeding (AUB). The latter broadly describes menstrual abnormalities including post-coital bleeding (PCB), inter-menstrual bleeding (IMB), as well as HMB. Statistical criteria for HMB (of greater than 80ml blood loss) has limited clinical utility and offers poor correlation with symptoms or management(2). The International Federation of Gynaecology and Obstetrics (FIGO) define HMB as ‘the women’s perception of increased menstrual volume regardless of regularity, frequency or duration’(3). This is a helpful definition as it focuses on the impact of perceived excessive menstrual blood loss on the patient’s quality of life. Passing large clots, frequent sanitary changes and ‘flooding’ through clothes can be physically, emotionally and socially distressing for the individual. However their absence does not preclude a diagnosis of HMB. In a study of 6179 women aged 15-55 years-old, a total of 1627 women described their menstrual loss as above average(4). Ninety-one percent of these women reported that when their periods were heavy it impacted their ability to perform sport and fitness activities. Furthermore, 75% felt less confident during this time with 91% stating that their heaviest menstrual flow days influenced the type and colour of clothes they felt able to wear. What about elite athletes with HMB? The elite female athlete is not immune to these problems with up to 37% reporting HMB(5). Indeed the physical and psychosocial effects of excessive menstrual blood loss are potentially greater due to the demands of training, travel and competition, as well as the high profile status of many female athletes. Indeed, female athletes with HMB are nearly four times more likely to cite negative impacts on training and performance as a result of heavy menstruation(6). Physical effects of HMB include fatigue, iron deficiency and anaemia(6,7) with up to 69% of female marathon runners reporting that HMB adversely effects their training and performance(5). There are other less quantifiable effects on player wellbeing and performance such as reduced confidence and concern about clothing(4). For a professional athlete the colour of the kit in which they play is often outside of their control. Anxiety about publicly visible blood loss is therefore not insignificant. The impact of HMB on athlete wellbeing is frequently underreported. In a study by Bruinvels et al (2016) only 40% of marathon runners with HMB sought medical help for this problem(8). Clinicians must take a proactive approach to identify female athletes suffering with HMB and encourage a culture that ensures they feel comfortable raising this subject with medical and coaching staff. Numerous validated screening tools to identify and quantify HMB exist and their use should be considered(9). The clinician must enquire about IMB, which raises the concern about a structural or histological abnormality. In women under 30 years of age IMB is much less likely to be pathological. Endometrial sampling should be considered if IMB persists for greater than 3 months in women aged 30 years or older, or with risk factors for endometrial pathology. Where appropriate, enquiry should be made regarding PCB, which is more indicative of cervical pathology. The status of cervical smears and a history of abnormal screening should be determined. In a female athlete this is especially important given their often nomadic lifestyle, which places them at greater risk to loss of follow-up and failure to receive cervical screening reminders, due to frequent changes of address. Lastly, it is important to ask about the current method of contraception and fertility wishes, as this will impact on the options for treatment. Table 1. Basic classification system. There are four categories related to structural pathology under the acronym PALM. Four categories are unrelated to structural anomalies plus one category defined as ‘not yet classified’ under the acronym (COEIN). The decision to perform a pelvic examination on a female athlete presenting with HMB may present an area of concern for the team clinician. The appropriateness of such an examination depends on the patient’s wishes, clinician’s competency and experience in gynaecological examination, and the clinical setting. An examination may be reasonable to perform when undertaken in a clinic room during a scheduled appointment but inappropriate if symptoms develop whilst on a training camp or competition, where a suitable medical room or facilities may not be available. Clinicians must discuss the potential benefits of clinical examination with the athlete. If examination is indicated but deemed inappropriate in the current setting, a recommendation should be made for this to be undertaken by a suitably trained clinician in an appropriate setting as soon as possible. If the history points to potentially serious pathology even without examination urgent referral should be considered(9). This statement provides reassurance that the clinician can reasonably commence treatment for HMB without feeling their initial assessment is incomplete, provided the history is not suggestive of underlying pathology. This is especially so, when considering that approximately 1 in 3 women do not receive any form of treatment prior to being seen in secondary care. Classically, oligomenorrhoea and amenorrhoea are menstrual disorders that are perhaps more commonly-associated with the female athlete. HMB is prevalent in this particular population and it is conceivable that its effects have an even greater physical and psychosocial impact on sportswomen than in the general female population. It is likely that HMB is under-reported in this group and the situation is further compounded by a lack of clear guidance on the initial assessment and management of this common condition. The aim of Part one of this article is to increase clinician awareness of HMB in female athletes. Part two will provide detail on appropriate investigation and treatment of these athletes in primary care. Dr Sheridan (@DrCraigSheridan) is a Sport and Exercise Medicine (SEM) registrar (ST3) in the East of England and continues to work as a General Practitioner. Prior to enrolling on the SEM training program Dr Sheridan held roles as a civilian sports physician for the military, working in the regional rehabilitation unit in Colchester and in an NHS community clinic. He worked for several years with Ipswich Town Football club as the academy doctor and continues to provide medical services for their first team. His other interests within the field of SEM include diagnostic and interventional musculoskeletal ultrasound and pitch-side medical care belonging to the faculty for the Advanced Trauma and Medical Management in Football (ATMMiF) course. He is a keen skier and enjoys the gym and park runs with his children. 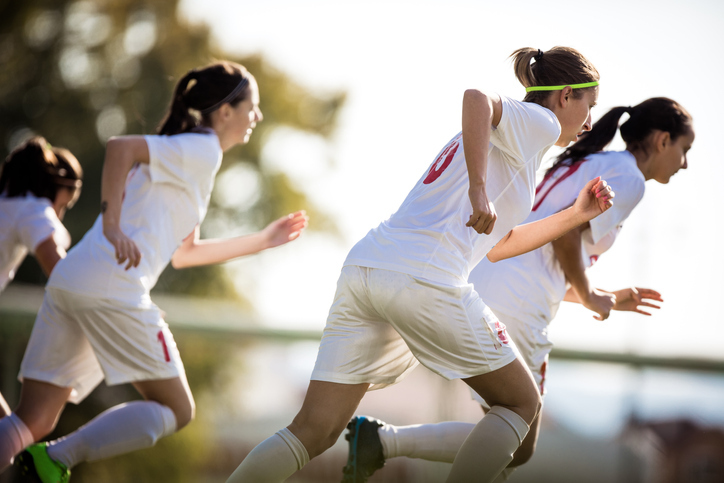 His continued work in general practice and for the Football Association with the England women’s development squads prompted him to write this article on HMB with Mr Simon Tarsha. Mr Tarsha qualified from the University of Leicester Medical School in 2005 and completed his Obstetric and Gynaecological training in the East Midlands deanery in 2017. His interests are in menstrual disorders and minimal access gynaecological surgery, diabetes in pregnancy and medical education. He is a member of the British Society for Gynaecological Endoscopy. He has been a successful sportsman himself, having played rugby union at a county and semi-professional level. He is a keen Leicester City Football club and Leicester Tigers Rugby Football club fan and now keeps himself fit with the slightly less menacing pastime of pilates and as a regular gym attender. Mr Tarsha is committed to improving women’s health in this important area of sport and exercise medicine. Fraser IS, Mansour D, Breymann C, Hoffman C, Mezzacasa A, Petraglia F. Prevalence of heavy menstrual bleeding and experiences of affected women in a European patient survey. Int J Gynaecol Obstet. 2015;128(3):196-200. Warner PE, Critchley HO, Lumsden MA, Campbell-Brown M, Douglas A, Murray GD. Menorrhagia II: is the 80-mL blood loss criterion useful in management of complaint of menorrhagia? Am J Obstet Gynecol. 2004;190(5):1224-9. Munro MG, Critchley HOD, Fraser IS. The two FIGO systems for normal and abnormal uterine bleeding symptoms and classification of causes of abnormal uterine bleeding in the reproductive years: 2018 revisions. Int J Gynaecol Obstet. 2018. Bitzer J, Serrani M, Lahav A. Women’s attitudes towards heavy menstrual bleeding, and their impact on quality of life. Open Access Journal of Contraception. 2013;4:21-8. Bruinvels G, Burden R, Brown N, Richards T, Pedlar C. The Prevalence and Impact of Heavy Menstrual Bleeding (Menorrhagia) in Elite and Non-Elite Athletes. In: Clarke SL, editor. PLoS One. 11. San Francisco, CA USA2016. Bruinvels G, Burden RJ, Cushway T, Brown N, Pedlar C, Richards T. The Impact Of Heavy Menstrual Bleeding (menorrhagia) And Iron Status In Exercising Females. Br J Sports Med. 2017;51(4):304-. Wang W, Bourgeois T, Klima J, Berlan ED, Fischer AN, O’Brien SH. Iron deficiency and fatigue in adolescent females with heavy menstrual bleeding. Haemophilia. 2013;19(2):225-30. Bruinvels G, Burden R, Brown N, Richards T, Pedlar C. The prevalence and impact of heavy menstrual bleeding among athletes and mass start runners of the 2015 London Marathon.Br J Sports Med. 50. England2016. p. 566. Matteson KA, Boardman LA, Munro MG, Clark MA. Abnormal uterine bleeding: a review of patient-based outcome measures. Fertil Steril. 2009;92(1):205-16. Heavy menstrual bleeding: assessment and management. NICE guideline [NG88]; 2018.